By now you may have read a number of news articles citing university research that proclaims you can raise your basal metabolic rate and burn more calories while working at a standing desk or treadmill desk. The Mayo Clinic has tried to help consumers and employers better understand the benefit of working in the NEAT zone by creating the NEAT™ Certification Standard that we’ve written so much about. And we’re constantly adding more reviews to our round-up of NEAT Certified Products as they come through the testing process at Mayo. 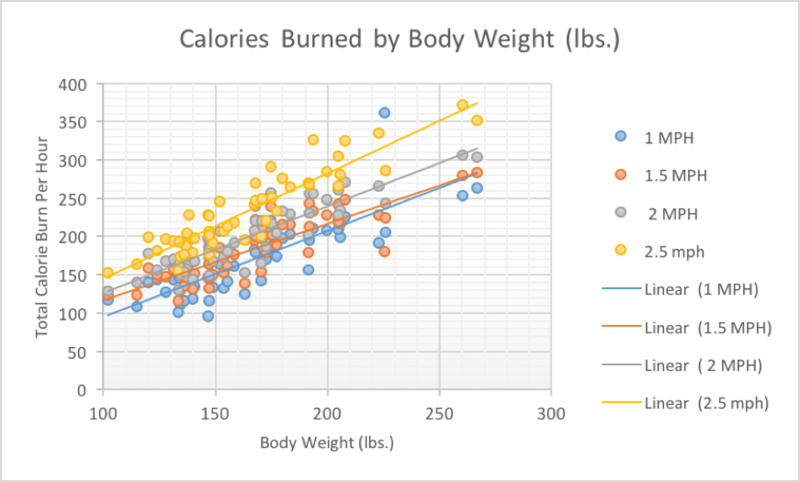 But the question of exactly how many more calories you can burn hasn’t been thoroughly understood because existing calorimeter algorithms are all based on cardio heart rates, which are by definition well above NEAT range. Until now. Office Fitness industry leader iMovR* has recently published its findings on Increased Calorie Burn for Standing Desk and Treadmill Desk Users, analyzing data collected by major institutional medical research partners using advanced ergospyrometry equipment. We finally have accurate calorimeter tables for these activities. You may be wondering, as we first did, just what the heck is ergospyrometry? This is the kind of equipment you’ll find on the International Space Station for measuring the performance of astronauts working out on a treadmill. Ergospyrometry is commonly used in performance sports, rehab therapy and a variety of medical research applications. We’re talking something that costs about a thousand times more than a Fitbit-like device. Ergospyrometry is the gold standard for measuring caloric burn, as well as protein, carbohydrate and fat burn, lung capacity, heart rate and other vitals. The 51 participants in the study were representative of the general population, ages 18 to 64, with a wide variation in fitness level, height, weight, occupation, and gender. Sitting vs. Standing: The study found that the average metabolic rate while sitting was 80 calories per hour (+/- 18) while the average metabolic rate while standing was 95 calories (+/- 24). Therefore, standing clearly met the definitional threshold of a 10% (or more) increase in calorie burn, classifying it as a NEAT activity. Standing vs. Walking: The general guidance for proper treadmill desk usage is to walk at speeds between 1.0 and 2.5 mph. This speed is conducive to higher productivity (more oxygen flow to the brain, etc.) without impacting typing proficiency (assuming an ergonomically-appropriate workstation). The graph below depicts the average incremental caloric burn from standing versus walking at these various speeds. As you can see, compared to the incremental calorie burn of moving from sitting to standing (orange bar), walking at the minimum 1 mph speed will burn you 5x as many calories per hour, and walking at 2.5 mph will burn you nearly 10x. Average calorie burn walking is 170 to 240 calories per hour +/- 50 calories per hour depending on the weight of the user. Any way you look at it, you burn about 2-3x more calories walking at these speeds than sitting. Other factors include the subject’s weight, height, BMI (Body Mass Index, integrating both weight and height), age and gender. Of these, the one with the most significant bearing on calorie burn, by far, was the individual’s weight. And that makes sense from a physics viewpoint – you’d expect that it would take more calories to move a heavier person than a lighter one, even at very slow walking speeds. To see the detailed charts for the other factors including height, BMI, age and gender see the detailed report. *Full disclosure: iMovR and WorkWhileWalking.com are co-owned by Thermogenesis Group, Inc. All iMovR’s sit-stand desks, sit-stand tables and treadmill desks are NEAT Certified by the Mayo Clinic. Treadmill powertrains – is your treadmill’s drive system sufficiently powered?